Famous rapper Notorious B.I.G. once said, "Mo money, mo problems," and while that may be true in some respects I can't help but think if I had "mo money," I would splurge a bit on some very unnecessary items. Not the least of which would be a "super yacht." Why a "super yacht" you ask? While being a fantastic way to (pardon the pun) showboat your money to the masses, it's one of the best ways to get around the world! Literally! The earth is 72% water, so why not travel on that water in style. Recently I've been exposed to a variety of water/ocean-going vessels like sail boats, ferrys, pantoon boats and smaller yachts in and around the Oakland Marina. 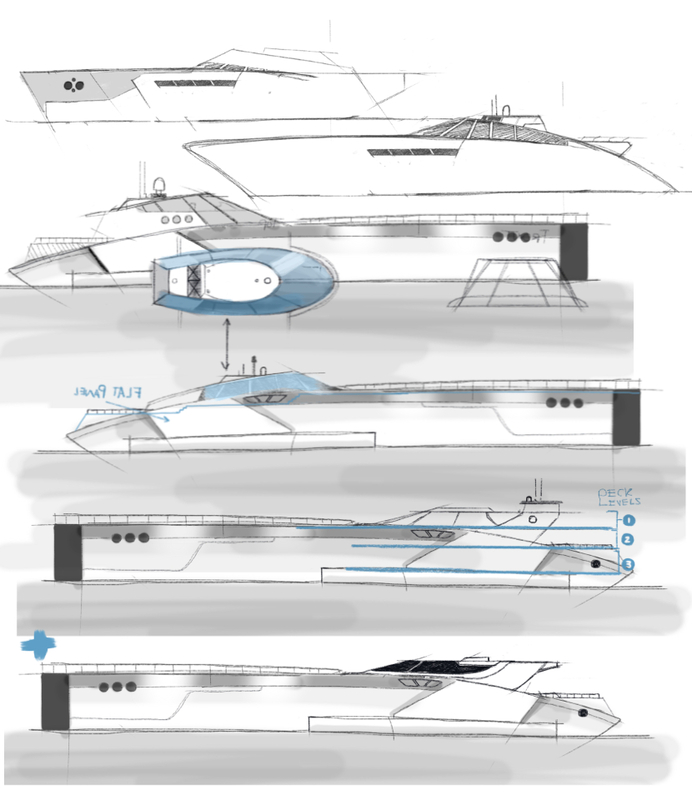 As a designer and admirer of all sorts of vehicles, water-born or otherwise, I couldn't help but be inspired to draft-up some of my own sketches and renderings on what I feel would be my perfect "super yacht." Part I, get to sketching. During my sketch phase I explored a number of factors, one of which was the type of vessel I ultimately thought would be perfect. I decided on a multi-hull vessel which is very similar to a pantoon boat, but with three hulls providing increased stability. Two smaller support hulls would rest on either side of a larger main hull which contains the living quarters and engine compartment. Explorations of the super yacht.